"You kneel down to the dry land, kiss the earth that birthed you..."
I'm tumbling through pink open air, kissing the clouds, in a flow state adjacent, the airplane lights crackling on and off -- keeping me citrusy and awake. In reality, I'm in my bedroom, pondering 40 degrees in April, happy that this isn't a hotel bed -- this is home. It's been a crazy few months -- somewhere between Picasso's Blue Period, the fluorescent lighting of JFK's JetBlue terminal (10pm on a Tuesday), and the mellow brilliance of bananas ripening in a hammock. What can I tell you? I've been working hard, running around, tasting the rainbow, flying the friendly skies, dancing through the corn fields between Denver, Chicago, and Corona Heights, enjoying the local flavors. As always, each place has its beauty and its spicy hue. In Denver, it's new love: the beet root cocktails, earthy and slightly bitter, and a Mexican palace in a strip mall where I celebrate National Margarita Day with faux mariachi style, the flautas as fake as anything, and the cliff divers tumbling into the crystal waters below. And it's a Dennis Hopper painting at the 20th Street Diner -- where my urban cowboy cuts into a Denver omelette and takes a puff from his oxygen tank, as the gingham curtains part to reveal barrels of peppers and root vegetables. I have another cup of coffee, if only to savor my burnt hash browns and the half dying ferns in the lazy winter light. In Chicago, I'm home again: the smell of dad's classic oxtail ragu hits me, accompanied with the signature scratch of the record. I sit on the couch, looking out into the garden, the dog sniffing my toes, the books piled high, the same neighbors walking through the door with crisp loafers and bottles of Portuguese wine. 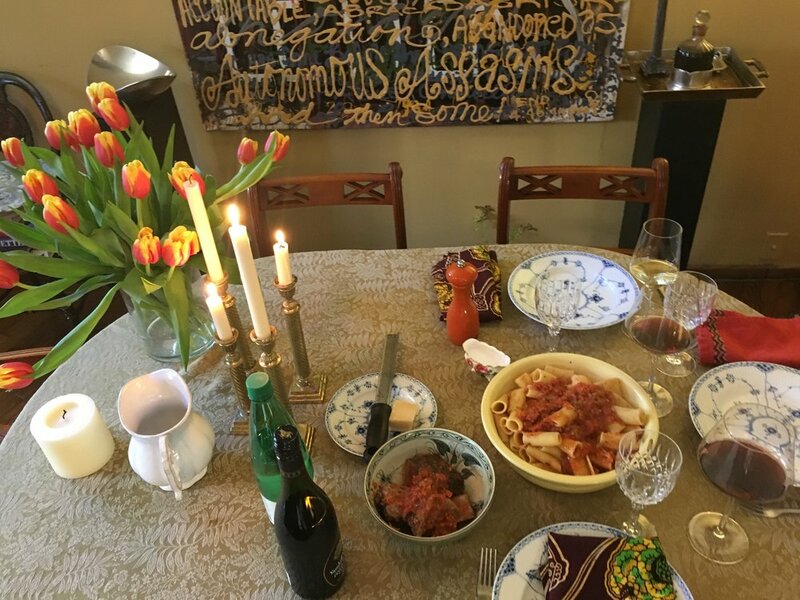 "I can't stay for dinner" they always say, "no, no, really I have a reservation" just as mom puts down a plate -- the ones I love, with scalloped edges and a mystery imprint that I have to press my fingers against, the sound of a sharp knife on a dull cutting board. In Brooklyn, I'm back in my second skin: skirting the pink bus and motorcyclists outside the 8th Avenue stop, headed to hot pot on some god forsaken corner with my iPhone dying ever so pleasantly. I'm threading the needle, bothering the regulars, flipping between maps and snaps, stopping to photograph the fish monger (his perfect yellow apron, his perfect yellow teeth), the silver of the fish heads, the oranges piled on the corner. I find my friends -- my New York fam, my everything -- waiting around the corner and we leaf through the 'all you can eat menu', wondering why the prices aren't mentioned, and ticking off the ingredients with a look that says "I'm new here" -- spam and instant noodles and tripe and greens thrown into a bowl of the spiciest broth. And in Corona Heights, it's the perfect Sunday: after two trains and a cab, I'm stationed in front of Barry White and the Chilean flag, nibbling on seafood empanadas, a completo with avocado, and pastel de choclo - some kinda sweet corn deliciousness, heated in a stone bowl, covering a layer of olives and raisins, and beef melting into shredded chicken (which I'm told I have to eat directly out of the bowl, don't be crazy). After two hours of beer and Soul Train (I love every song), I dip my spoon into the best dulce de leche of my life -- flakey fragments sticking ever-so-gently to sweetened condensed milk, spun into sugar. There is life between these moments, bottles of water, gasps of breath, scribbles of errands, but mostly there is joy -- the quick jolt of champagne over the rim, the moment spilling over.